The online food ordering sector is seeing lot of churn in off late, not only in India, but also at a global level. Germany based Rocket Internet, who have built and backed multiple online multi-million dollar startups across the globe, is leading the charge when it comes to online food and grocery business. Rocket Internet has today announced that they have created a “Global Online Takeaway Group ” that will be the umbrella firm for their food related companies including FoodPanda. They also made multiple investment and acquisition announcements, which includes picking up 30 percent stake in FoodPanda’s rival service Delivery Hero for USD 586 million. They have also acquired leading Southern European online food takeaway companies La Nevera Roja in Spain and Pizzabo in Italy for an undisclosed amount. So, the newly formed Global Online Takeaway group will be combination of their own Foodpanda business, their stake in Delivery Hero, La Nevera and Pizzabo. The combined group will give them a coverage of 140,000 restaurants across 64 global markets. While this is a big news, no one has paid attention to an interesting announcement in the official press release which they put out. Foodpanda, which recently acquired Tastykhana, has also acquired Indian operations of JustEat. With this acquisition, Foodpanda has furthered strengthened their positions as the largest online and mobile food ordering service in India. The Press Release states, “ In India, foodpanda consolidated its market leading position by taking over JustEat’s India operations following the integration of the former Delivery Hero business TastyKhana in November 2014. It also acquired key competitors in a number of other Asian markets”. 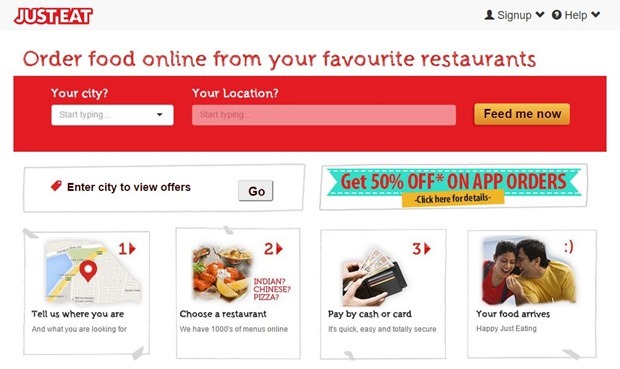 JustEat started way back in 2006 and was earlier called HungryZone. They have operations in 10 Indian cities including Bangalore, Delhi, Mumbai, Bhopal, Kolkata, Chandigarh, Goa, Indore, Hyderabad and Jaipur! With JustEast’s acquisition of India Operations, Foodpanda now has a total coverage of over 526 cities in 39 countries across 5 continents! Indian Startup 3D-ing Unveils The Most Affordable 3D Printer For Just $325.